Bloodroot (Sanguinaria canadensis) - Nudges out physical, emotional, mental and spiritual genetic patterns inherited from generations of family members to make way for the light of new potential. Reawakens living as a fully functioning human. I AM the embodiment of my full potential this lifetime. Bloodroot is a powerful herb that grows wild in the shady woods of mid to northeastern North America. In winter, the reddish-brown rhizome clumps are usually partially visible above ground. In March, white flower buds appear on short stalks wrapped in gray-green leaves. The flowers open to reveal 8 to 12 white petals and a bright yellow center. Bloodroot is considered by United Plant Savers to be “At Risk” of not being sustainable in the wild due to over harvesting and loss of habitat. Fortunately, it can also be cultivated and makes a beautiful shade garden plant. We grow bloodroot and other endangered herbs at Tree Frog Farm to help preserve them. The red juice expressed from the root makes an excellent die for cloth, yarn, and many other materials, and it can be used as a wood stain. As an herb, bloodroot is antiseptic, locally anesthetic and has been used traditionally for fevers, rheumatism, and as an expectorant. Externally it has been used to treat abnormal skin growths. Recently there has been increased interest in bloodroot as an anti-cancer herb. Care needs to be taken when using powerful bloodroot herb. Internally it can be toxic and induce vomiting; externally extended use can cause local skin inflammation. Flower Essences do not contain any plant material, are vibrational only and safe for use any time. 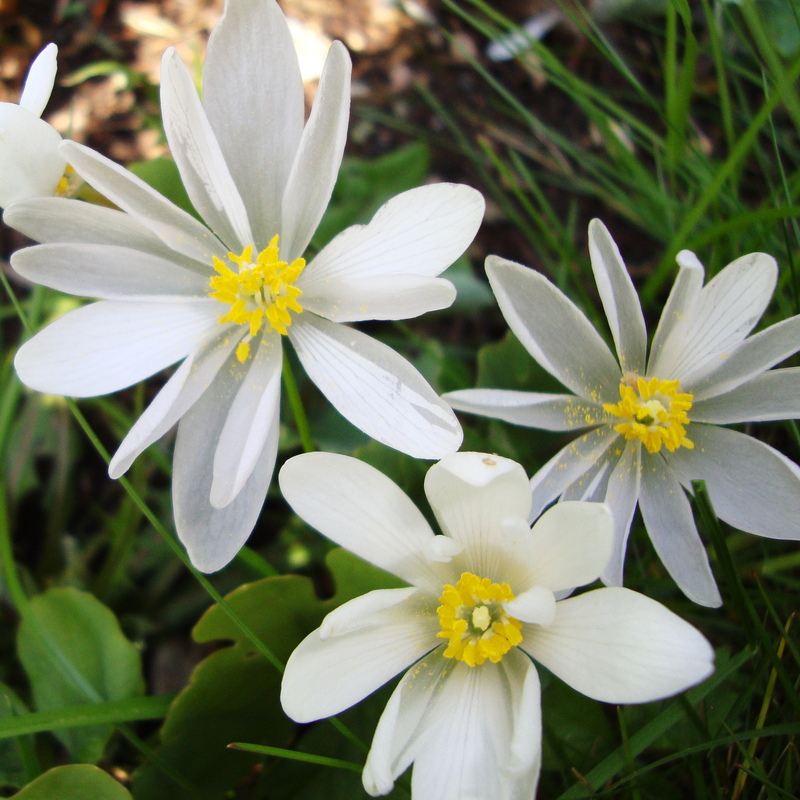 Use Bloodroot Flower Essence to facilitate transformation of genetic tendencies such as alcoholism, blood sugar imbalances, autoimmune disorders, depression, brain chemistry imbalances and heart problems. It also helps to transform genetic attitudes such as ingrained fear, hopelessness, mistrust, deep anger and separation from the Earth. When you are ready to step out of the inhibiting beliefs of your ancestors and embrace the potential all of us have as humans, bloodroot will assist your journey to full health. It works best in combination with other essences. As an example, you might use Skunk Cabbage, Chamomile, Orange Wild Honeysuckle and/or Boneset flower essences in conjunction with Bloodroot to retrain an autoimmune/nervous system response of chronic shingles. Or for a family history of depression, you might consider Lupine, Meadow Rue, Rosa Rugosa and/or Saskatoon flower essences in addition to Bloodroot. Quantum geneticists say that DNA genes are potentials, that any gene can express in many different ways. What causes the choice for “genetic disease”? A gene may become habituated to expressing in a particular way by family generational patterning, by engrained belief systems or by environmental influences. How can you clear out old programming to make way for new potential? Bloodroot flower essence works through your energy fields and through the etheric body blueprint that expresses through your DNA to change genetic codes that hinder the embodiment of your full potential. What is the 95% of DNA that is called “junk” really about? It is the time for humans to dig deep, to bring buried treasures of human DNA that went dormant after Lemuria and Atlantis to the surface. Bloodroot Flower Essence also reawakens cellular memory of what it is to be fully human. Bloodroot essence does not directly work on karmic issues, but can be an ally when used in conjunction with other essences, like Purple Passion Rose and Rose Campion that do directly work with the karmic issue that is being played out with your current family. Bloodroot Flower Essence was made by the no-pick method of working directly with the plant spirit. While the essence was being made a matrix of amber, andalusite, bloodstone, drusy quartz, elestial quartz, green tourmaline, icosahedron cut quartz, Lemurian Seed crystal and shaman stone crystals were placed among the plants with the mother bottles. The sun acts as a transformer to step down spiritual energies from higher dimensions. While the essence was being made, Amber acted as a lens to receive and focus sunlight for this purpose. Andalusite helps you retrieve ancient information and provides energy field repair and protection. It enables you to attract Light while protecting your nervous system from being overloaded. Andalusite assists knowing Earth is your home this lifetime so you can enjoy living here and function easily in the physical body. Bloodstone is an intense healing stone that helps to balance your body while your energy fields realign. It also facilitates admittance to the spiritual realms of the ancestors. Drusy quartz crystals help to energize and stabilize your subtle bodies. Elestial Quartz downloads energy infusions from the higher dimensions, giving you greater access to wisdom from your Higher Self, Guides and Angels. It assists you to ground this wisdom into your daily life. Green tourmaline holds the essence of the plant kingdom and assists with transferring the vibrational frequency of minerals to the vibrational frequency of plants. It can stimulate proper cellular functioning and healing. Icosahedron cut quartz has 20 (5X4) equilateral sides. It is a bridge between the 5th Dimension - the entry into the unified Spiritual realms - and the 4 cardinal directions (N, S, E, W) on Earth. Lemurian Seed Crystal embodies the soft loving energies of the angelic and cosmic realms. Shaman stones are guardians during the healing process, providing psychic protection and energetic shielding during the soul retrieval process. They are excellent for vibrational healing because they bring inner balance as they align the chakras and harmonize the meridians. The actions of the crystals inform the way this flower essence seats into the body/mind. While Bloodroot Flower Essence was being made the sounds of rattle and spirit song coming through Diana’s voice were infused into the essence.